Artist's concept of the huge black hole at the heart of the galaxy M87, the most massive known black hole to date. Gas swirls around the black hole in an accretion disk. 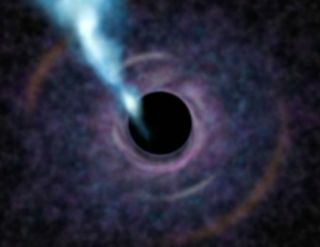 The bright blue jet shooting from the region of the black hole is created by gas that never made it into the hole itself but was instead funneled into an energetic jet. SEATTLE — Astronomers have now pinned down the weight of the most massive black hole known, a huge beast with the mass of 6.6 billion suns, a new study reports. This enormous mass is the heaviest ever measured for a black holeusing a direct technique, researchers said. The supermassive black hole is about 54 million light-years from Earth. While that seems far, it's actually the closest black hole of its weight class to our planet. And the discovery may hint at future discoveries of even more gigantic black holes, researchers added. "Our ability to obtain such a robust black hole mass for M87 bodes well for our ongoing efforts to hunt for even larger black holes in galaxies more distant than M87," study co-author Tod Lauer of the National Optical Astronomy Observatory said in a statement. The researchers presented their results today (Jan. 12) here at the 217th meeting of the American Astronomical Society. Two studies on the discovery will appear in a future edition of the Astrophysical Journal. Black holes tend to come in two primary size categories: Stellar black holes, which are typically between 10 or 20 times the mass of the sun, formed from the collapse of massive stars. Supermassive black holes, however, reside at the heart of galaxies and usually contain millions or billions of solar masses. The researchers "weighed" the supermassive black hole at the center of galaxy M87 by probing the motions of stars around its center. They did this by combining data from the 8-meter Gemini North telescope in Hawaii and a smaller instrument in Texas. Researchers measured the speed of stars orbiting the black hole both near its heart and far away, on the outskirts of the galaxy. They were able to track stars near M87's core with 10 times greater resolution than previous studies, researchers said. It's "just an enormous improvement compared to previous work," said co-author Joshua Adams of the University of Texas. By studying the faraway stars, researchers were able to get a handle on what was going on in the so-called "dark halo," a region surrounding the galaxy that is filled with dark matter. Dark matter is a strange type of mass that gives off no light but is detectable by its gravitational tug on other objects. Studying the distant edges of a galaxy, far from the bright center, is tricky, researchers said. "That has been an enormous struggle for a long time, trying to get what the dark halo is doing at the edge of the galaxy, simply because, when you look there, the stellar light is faint," said lead author Karl Gebhardt of the University of Texas. The observations of stellar orbits — both close-in and far away from M87's heart — allowed the team to pinpoint the mass of the galaxy’s black hole at 6.6 billion suns. But measuring such a massive black hole is only one step toward a greater goal, according to the researchers. "My ultimate goal is to understand how the stars assembled themselves in a galaxy over time," Gebhardt said, adding that such an insight is extremely difficult to come by without knowing how much mass resides in the black hole, how much in the stars and how much in the dark halo. The new results also hint at another possibility for the future: the chance to actually "see" a black hole. So far, astronomers have accumulated only indirect evidence of black holes' existence, researchers said. However, the black hole in M87 is so massive that astronomers someday may be able to detect its "event horizon" — its edge, beyond which nothing can escape. The event horizon of M87's black hole is about three times larger than the orbit of Pluto, researchers said — large enough to swallow our solar system whole. M87's event horizon covers a patch of sky large enough to be imaged by future telescopes; the technology to do so does not currently exist, researchers said. Future astronomers could use a worldwide network of submillimeter telescopes to look for the shadow of the event horizon on a disk of gas that surrounds M87's black hole, Gebhardt said.